The last few days of classes are signaled by the horrendous massing of crows in the pines outside of Hagey Hall. They are harbingers of the melancholia that gathers in the spleens and noggins of professors and students during these final dismal days of November. To be sure, a few oblivious profs are satisfied with their work over the last weeks, confident they have cultivated in their charges some new seeds of knowledge and perhaps even watched one sprout into something green and leafy. But most of us are as usual chagrined that our efforts at releasing our students from their mental prisons of sulky jadedness have failed so decisively, that our syllabusic reaches exceeded our pedagogical grasps, that our pupils are now leaving our precincts containing so much less than what we imagined in our wild September dreams would puff out their still labile brains by term’s end. As the last leaves fall from the stubborn oaks, as the crows bruit their winter plans for southern Kentucky, as the geese honk their miserable laments to their lost fellow (gunned down, unbelievably, on the North Campus, where normal humane impulses are attenuated, evidently), we take stock of our successes as teachers and as taught, and most of us, WIP very much included, recognize we have fallen short yet again. 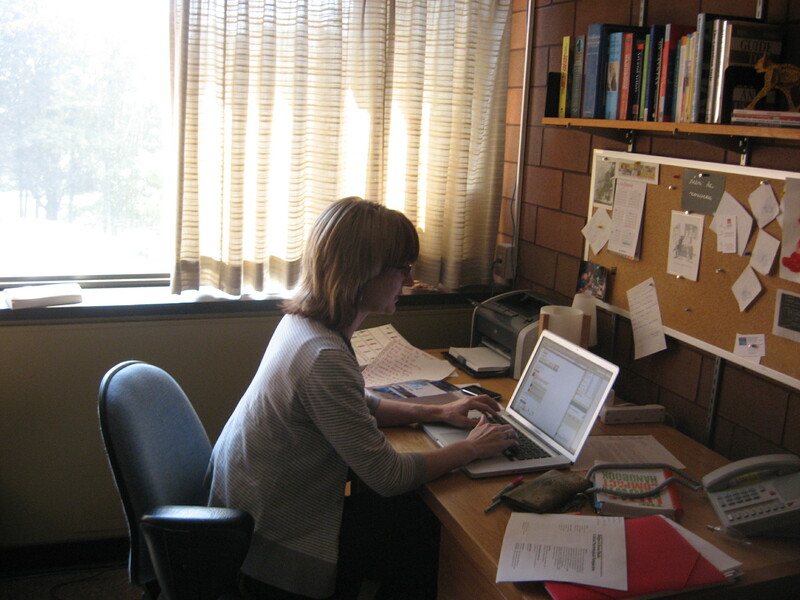 A few students, whose previous encounters with the English department qua English department consisted solely of sleep-interrupting sessions with its various pontificators in dispersed classrooms across the campus, now find themselves timidly searching amongst the randomized office numbers in the Brown Warrens of Hagey Hall. On a quest for face-time with a professor who they never before wished to view but from the back of a classroom, these hapless individuals, now that all hope is not just lost but actively fleeing, have arrived to request some kind of academic lifeline that will allow them to transform their mediocre “work” of the previous three months into grades commensurate not with their performances but with their aspirations. Still, melancholy isn’t all about sadness and enervation; there is a lighter side to black bile. Where would any of us be, student and professor alike, without the good humour that emerges from the preposterousness of our situation, this wacky idea Plato and his gang dreamed up? The Academy! A place of advanced thought. Maybe in Athens, with its stone temples and open sewers. Any serious discussion there was a giant step up from the daily rounds of excrement and death. But in Waterloo? We compete with the billion-headed beast that is our hyper-civilization. Have you watched Jersey Shore? Did you play Call of Duty: Black Ops II? To think we could ever teach and they learn! How could you even hold their attentions for a minute? And if you could, are you really capable of bringin’ it? Have you got the juice? Of course not. That’s just crazy talk. There is too much going on, and none of it in your classroom. Each generation of moderns is cognitively unresponsive to the previous. And for good reason. As Thoreau noted, “Practically, the old have no very important advice to give the young, their own experience has been so partial, and their lives have been such miserable failures.” If Thoreau is right, we have even less reason to expect our students to remember anything we teach them because so much of it is merely an account of our confusion and weakness before the Knowledge we purport to be selling. This is the Faculty of Questions, Not Answers. All that lofty ignorance can get a bit old. At least in the Greek agora, you could hear Socrates discourse and get drunk on honey-wine at the same time. And there it is: what Thoreau didn’t know, or, more likely, knew very well. The Academy is a river that flows both ways. Or, if that image doesn’t scan, a pond whose waves lap each shore. “I myself have lived some thirty years on this planet, and I have yet to hear the first syllable of valuable or even earnest advice from my seniors. They have told me nothing, and probably cannot tell me anything to the purpose.” Mayhap (yes, this is a word) Thoreau was an autodidact, but one suspects there was a syllable or two from, say, Emerson, that slipped past Thoreau’s pugnacious egocentrism. And, more important for the melancholiacs of November, Thoreau taught his elders in Concord a great deal. So if we have fallen short of our fantasies of the Great Course, if the class ended without the gestalt, the epiphany, the grok, mayhap (still a word) we should search our own benighted minds, and look for any seeds that our students, despite the stony ground they had to work with, managed to plant there. It’s Friday afternoon in mid-September. It’s sunny but chilly outside. It’s the end of the first week of teaching. Your hard-working professors are writing lectures and making PowerPoint (or Keynote, in my case) presentations for classes next week. 2. We dress a lot alike–jeans, boots, cardigans. 3. We have professor glasses and dyed hair. 4. We are both using our laptops because we have loaned our iMacs to Professor Marcel O’Gorman to be used by artists presenting at the Society for Literature, Arts, and Science conference next week. 5. 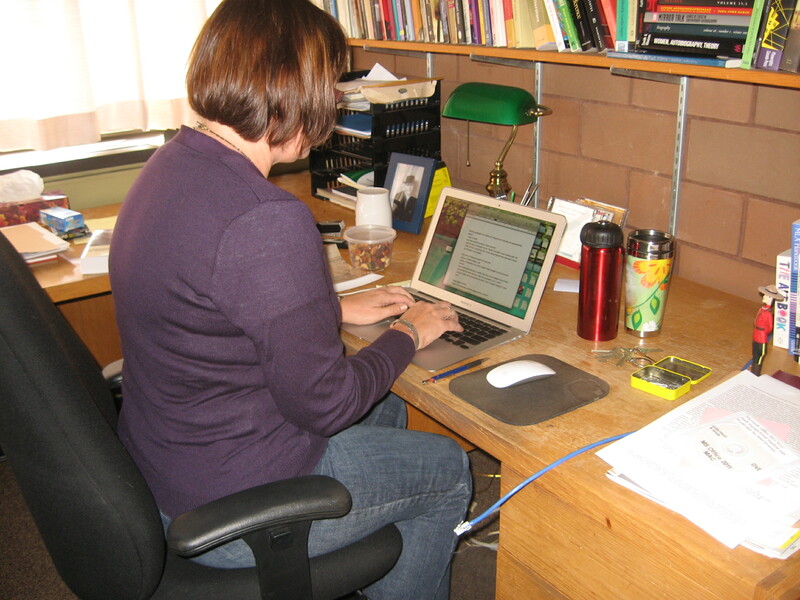 We must remember to combat the academic stoop-shoulder. Yoga helps; so does basic stretching. Preparing for teaching takes a lot of time and energy. (Thank goodness for wikipedia and google images, I say). If we do all that work beforehand we can make it look easy when we’re in the classroom. Sometimes the class is a “win”! ; sometimes it’s a “fail”! A lot of that has to do with how comfortable we are with the material. But we also know that sometimes no matter how prepared we are a thousand other factors can impact how a particular class will go. When it goes well, we’re on a high. One of the things I really like about my colleagues is that we often talk about teaching: what decisions we’ve made about books and assignments; how a particular strategy worked or did not. We commiserate about heavy marking loads; but we also share the thrill of those brilliant student projects, comments in class discussion, and essays. We tell stories about our classrooms–I mean the physical spaces in which we teach, often complaining that they are not right for the kind of teaching that works best for English courses. And we laugh or rage at some of the absurd things that can take place in the classroom. For me this week it was techno failures, even old-fashioned techno ones: no chalk in one classroom; a white board covered with NON dry-erase marker in another. Sheesh. But we’ve always got the book, and we’ve always got our voices, so sometimes we just talk and, hopefully, students are listening.